Maini Materials Movement (A Maini Group Company) was recognized for its performance in Material Handling Equipment Manufacturing at recently concluded ET Logistics Awards at Gandhinagar, Gujarat on 22nd January 2016. “ET Logistics Award”, an initiative by Radeecal communication to drive out the best players in Indian Logistics sector, aims at recognizing their excellence in service in terms of setting up benchmark for their respective industries. The Economics Times took an opportunity to honour their achievements and to encourage the highest standards and professional approach to the practise of logistics & transport. The event witnessed overwhelming number of audience, industry bigwigs, lawyers, government employees and many associated with logistics industry. The attendance of this year was topped only by the quantity & quality of entries for the hotly contested award categories. “We promise to provide "Best-in-class” material movement solutions that ensure optimal resource utilization and high uptime for complete peace of mind. With India getting ready for next phase of economic reforms with progressive government in place and manufacturing & logistics industry setting up for a boom , our customers see us as their preferred partner for material handling & intra-logistics solutions. 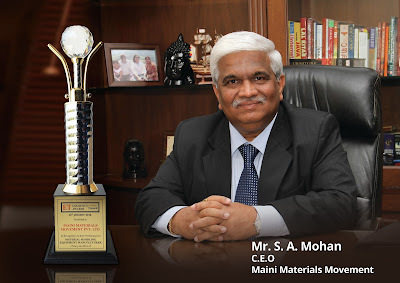 This award attests not only our material handling solutions and innovative warehousing, but also the high degree of customer orientation of our services" said Mr. S A Mohan (CEO, Maini Materials Movement). Maini Materials Movement (MMM) is a Leading Industry Player in MATERIAL HANDLING, STORAGE SOLUTIONS and PEOPLE MOVEMENT space. MMM has a strategic alliance with the NACCO Materials Handling Group (NMHG), USA for the sale and marketing of the Yale brand of counterbalance fork lift trucks, reach trucks, order pickers, very narrow aisle equipment and the manufacture of the RCF series and MR series in India. Their solutions range from Forklift Trucks, Reach trucks, Order Pickers, Flame proof Trucks, Battery Operated Pallet Trucks, Manual & Electric Stackers, Hand Pallet Trucks, Platform Trucks, Goods & Scissor lifts, Tow Trucks and Dock Levelers to help customers achieve high level of space efficiency and manufacturing productivity. I really appreciate the given information in above content, this will be very helpful for the same business kind of Find-a-Distributor in USA which involves in directory of distributors of selling material handling, Demage cranes & components , supply chain, logistics equipment and a forum platform where user find local Material handling equipment manufacturers in Scottsdale AZ, USA. Hydraulic Scissor Lift Supplier in indiaHydraulic Scissor Lift Manufacturer in india.,Hydraulic Scissor Lift Provider in india. Tech Mech Handling Equipments Hydraulic Scissor Lift Manufacturer in india. Best Scissor Lift in IndiaHydraulic Scissor Lift Manufacturer in india. Best Scissor Lift Supplier Scissor Lift Manufacturer India Welcome To Tech Mech Group. Best Hydraulic Scissor Lift Supplier Scissor Lift Manufacturer India Welcome To Tech Mech Group.